Something I really regretted from the twins’ birth is not getting a photo of their fused placentas. It was big and ugly and had two umbilical cords. It was amazing and I loved it. In the early to mid 2000s, there was a rage to exploit vulnerable people by putting them on TV and giving them extensive surgery, all of which would be shown in gruesome detail. The most mainstream of these shows was Extreme Makeover. Now the show lives on with the spin-off, Extreme Makeover: Home Edition. But in the beginning, it was all face and bodies. 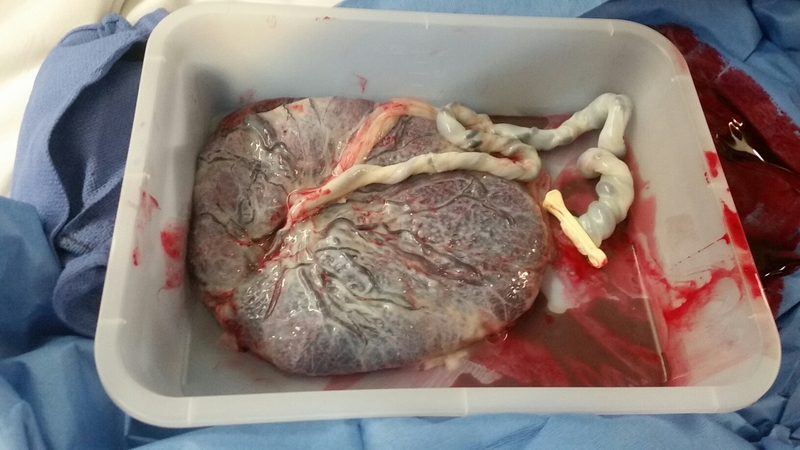 This beaut is 7 or 8 inches at the widest, and upwards of 3 lbs, if it’s an average placenta. Look at those blood vessels! The placenta is a fully functioning organ that your body grows, uses, and then disposes of when it’s no longer needed. It is really fantastically ruthless. The placenta produces hormones, filters blood to the baby, delivers nutrients, and signals to the body to start milk production. Then, its job complete, it lights out for the Territories. The placenta begins to form when the blastocyst is formed – the placenta is made from the same stuff as the baby is; it’s part maternal cells and part paternal cells. This really is one interesting organ – nothing else (besides the actual baby that is) grows like this or functions like this; part organ, part gland, part mother, part father, fully unique. Keep in mind that this thing is only attached to your body by blood vessels. Your brain – in a primitive sense – doesn’t have any connection to it. And yet, when the time comes, the placenta detaches and is pushed out of the uterus just as the baby was before it. Typically, the placenta attaches to the side or top of the uterus (depending on where it is, it cushions the mother from kicks or even feeling the baby move much at all), but if it attaches to the bottom, it can cover the cervix, which can lead to problems. Likewise, problems can arise if not all the placenta is dispelled. The remaining pieces stay attached to the uterus, keeping the blood flowing – that is, hemorrhaging. Ultimately, however, placentas are a thing of bloody wonder. I highly suggest you do a Google image search of them, to fully appreciate their glory. You won’t regret it.